I have a conspiracy theory, and its a good one if I don't say so myself. I call it the Alarm Snooze Button Conspiracy Theory. Ever notice that on every alarm clock, or phone or watch with an alarm, that the snooze button is the largest button? Just look at the screen shot I took this morning of my phone. 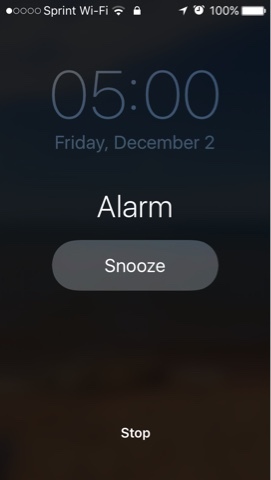 The snooze button is big and right smack dab in the middle of the phone's screen, while the stop button is barely noticeable at the bottom edge. Most table table alarms have the snooze button taking up about half the top of the dang things. This is done by design. Some might argue that it is simply because it is easier for a half awake person who needs 10 more minutes of rest to blindly smack at the source of noise that awoke them too early. But I think it is a plot to make us all lazy. And it's working. Since the snooze button as become common place, few people get up on the first sounding of the alarm. I didn't take the time to research any actual data on this, but in this day and age no one fact checks anyways. So I feel it's safe to say only about 139 people in our once great punctual nation actually still wake up on time. It's obviously a master plan of some elitist, globalist movement secret society who is hell bent on reducing America's world leading productively. And they are doing it one 10 minute snooze at a time. Whoever this shadow power is, they have every clock, phone and watch company in their pocket like a... like a.... in their pocket like a... drawing a blank. Dang it. Wish I could think of something that a watch maker made that would fit in a pocket. That would have been an epic way to end this blog post with.